Volunteers are getting rewarded for participating in social action with organisation, Gem. The Going the Extra Mile (GEM) project is a mobile payment platform that rewards its users for participating in social action. “Once a person has attended an event, we reward them with GEMs. One GEM is equivalent to a Rand, and with those gems people can buy data, airtime, electricity, movie tickets – a whole lot of things,” said David Shields, social entrepreneur and co-founder of the organisation. Volunteers are rewarded between 30 to 50 GEMs, depending on which event they attend. The non-profit organisation converts its received corporate sponsorship into gems. Users of the platform receive these gems by volunteering at GEM’s various partners that include orphanages, soup kitchens, animal rescue centres and education centres. One of the partners involved with the project is Food for Waste in Orange Farm. “We reward unemployed people in their community to collect trash in Orange Farm, recycle what can be recycled and then drop off the remaining rubbish at a Pikitup depo, which they receive food parcels for,” Shields said. 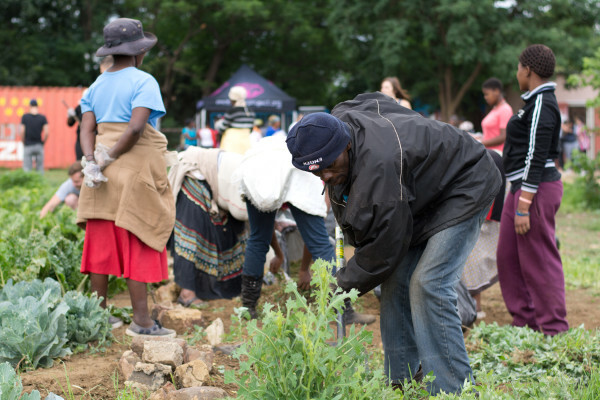 Jabulani Dlamini, founder and chairperson of Food for Waste, said that the response from the community has been overwhelming since they began their partnership with GEM. “When we started, we only attracted the elderly people of the community. We are now suddenly attracting young people who are there because they are interested in GEM,” he said. GEM user Kerry Langschmidt thinks the idea of being rewarded for helping out in communities is good. The concept of rewarding social action is strange for some. “I don’t think that rewarding people is really a solution to societal issues,” said Lindiwe Malindi, a Sociology Masters student.